Here in the United States, it is often assumed that we invented the concepts of grilling and barbecuing. Although our early outdoor cooks perfected the art of American barbecue that involves meats rubbed with spices that are slow-smoked and finished with sauces, the thought that somehow James Beard or Sunset Magazine invented grilling in the 1950s is ludicrous. Grilling has been around as long as mankind has had hunting and fire, and there’s really no need to speculate which one of our hominid ancestors figured out that grilled meat tasted better than raw meat, but obviously someone did. And it probably happened in Africa or Asia, and was no secret but rather a standard technique. These early cooks and later generations learned that grilled meats were more tender if they were first soaked in a liquid and were more flavorful if they were coated in local spices and herbs–and with chile peppers, after about 1550. An early Asian grilling tradition was Mongolian barbecue, invented by nomadic tribes who grilled their goats and lambs over open fires rather than carry around huge metal cooking pots. They introduced their techniques into Beijing in the seventeenth century, and from there over the centuries spread around the world. Mongolian barbecue has changed now, and the traditional lamb or goat has been supplanted by beef, chicken, and pork–but it still should be grilled and treated with sauces. Another Asian grilling specialty is the satay, which is chunks of meat that are marinated in chiles and spices, skewered (usually on thin pieces of bamboo), and grilled over small charcoal fires. Satays are part of a grilling tradition in the “skewer crescent” that extends from Morocco and Spain through the Middle East and into Southeast Asia. Think “Asian kebabs” and you will have satays. In terms of meat consumption, Westerners are far more carnivorous than the peoples of Asia. In Thailand, as in many other countries, a little meat goes a long way when it is combined with vegetables and sauces and served with vast quantities of rice. Meat is frequently reserved for special meals and holidays, and then it becomes the centerpiece of an extravagant meal. Because meat is expensive, no part of the animal is wasted, as we found in the vast wholesale meat market in Bangkok. We saw all the parts of pigs and beef, actually water buffalo. There were stomachs, ears, heads, feet, and we knew that we had eaten some of them in the various dishes. However, prepared properly, even what would be considered a throw-away, or lowly meat in North America, can be turned into a tasty meal. Virtually all meats end up being grilled in Asia–in additional to the usual beef, chicken, pork, and seafood, we also saw mystery meats of all kinds, and even turtle meat satays. In the recipes that follow, we offer a survey of the different styles and ingredients of grilling in Asia, but as there are hundreds of different Asian grilling recipes, we have only been able to offer a small but tasty sampling. This is our version of a Korean rib dish. If these ribs were going to be smoked, we would not boil them first, but since they tend to be fatty, we do boil these before grilling. 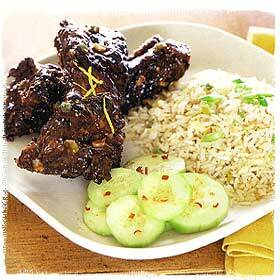 Serve the ribs with fried rice, stir-fried vegetables and cucumber slices sprinkled with hot ground red chile. Cut the ribs into individual pieces. Place in a pot, cover with water, and bring to a boil. Reduce the heat and simmer, uncovered, for 30 minutes. Remove and drain. Combine all the remaining ingredients and allow to sit at room temperature while the ribs are simmering. Grill the ribs over a medium heat for about ten minutes without basting. Move the ribs away from direct flames and cook about ten minutes longer, basting consistently with the sauce until crisp. The marinade in this recipe also doubles as the dressing for the salad. We like to serve this salad with the shrimp hot off the grill, but it can be prepared ahead and served chilled. This is a meal in itself, but why not treat yourself to a chilled gazpacho and a dry white wine? Combine all the ingredients for the marinade in a blender or food processor and puree until smooth. Place in a bowl and allow to sit at room temperature for an hour or two. Remove the marinade from the refrigerator and strain the mixture, saving both the solids and the liquid. Combine the solids with additional peanut oil and brush on the shrimp. Place in a bowl and marinate in the refrigerator for a couple of hours. Pour the oil in a deep-fat fryer or in a wok to a depth of a couple of inches and heat until hot, 375 degrees. Add the egg roll strips in batches and fry for 30 seconds to crisp. Remove, drain and sprinkle with the ground red chile. Place the shrimp in a vegetable basket and grill over a medium-hot fire for about 6 minutes, shaking the shrimp often so that they are cooked evenly. Toss the greens with the reserved marinade liquid and divide between chilled salad plates. 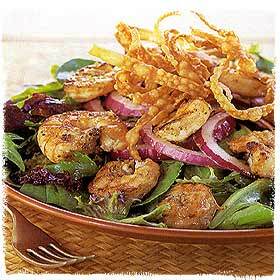 Arrange the sliced onion over the salads and top with the shrimp. Garnish the salads with the crispy strips and serve. Pork is a preferred meat in China and Southeast Asia, so it is not surprising to find it combined with chiles and traditional Asian seasonings. The marinade is also excellent with chicken and fish. Serve the grilled pork steaks with jasmine rice, sweet and sour vegetables, and a green papaya salad. Place all the ingredients, except the pork, in a blender or food processor and puree until smooth. Transfer to a bowl and let sit for an hour to blend the flavors. Cover the pork steaks completely with the marinade and let sit in a glass bowl for 3 hours, covered, in the refrigerator. Bring the steaks to room temperature and grill over a medium fire for 10 to fifteen minutes, turning often, until the internal temperature reaches 160 degrees F., which is medium. Cut open to test for doneness if you prefer. You can use any leftover marinade as a basting sauce, but be sure to simmer it in a saucepan for 20 minutes first. The small island of Lombok is the home of this recipe. The word Lombok translates to “spicy chiles” and is the perfect descriptor of the food on this island next to Bali. Rub the hen completely with the salt and oil. In a food processor, blend the shallots, garlic, shrimp paste, sugar, chiles, pineapple juice, and pineapple to form a paste. Grill the hen slowly over hot coals, or under a preheated gas or electric broiler for 5 minutes. Baste the hen well with the paste on both sides, and grill the hen for 3 minutes. Finally, spread all the remaining paste on the skin side and grill for 10 minutes, or until done. This recipe is courtesy of the Equatorial Penang hotel in Penang, Malaysia. It is a classic Indonesian dish that combines the heat of chiles with the exotic fragrances of the Spice Islands. Note that this recipe requires advance preparation. Combine the ginger, chiles, garlic, shallots, cumin, anise, turmeric, lemon grass, and sugar in a food processor and puree, adding water if necessary. Marinate the chicken strips in this mixture for 12 hours, covered, in the refrigerator. Thread the chicken strips onto separate satay sticks which have been soaked in water. Grill the satay sticks over coals until the meat is done, about 12 minutes, turning often. Serve the satays with the Peanut-Chile Sauce on the side and garnished with the diced cucumbers and onions. Chickens grilled in this manner are very popular throughout Thailand, where they’re sold in bus depots in villages, portable food stations, at the beach–everywhere. The Thais would use bamboo skewers, but metal ones work fine. The skewers keep the chicken flat as it cooks on the grill. You will notice that the chicken is doubly spiced, like American barbecue, but much hotter. Those Thais like their food very pungent! The chiles traditionally used are prik chee fa, with medium-hot, cayenne-like, bright red pods. Serve with sticky rice with mangoes and Thai iced tea. To make the paste, place all the ingredients in a food processor or blender and process to a thick paste. Using poultry shears, or a heavy knife, cut down both sides of the backbone to cut the chicken in half. Remove the backbone and place the chicken on a cutting board skin side up. Press hard on the breastbone to break it and flatten the bird. Loosen the skin and rub the paste all over the chicken, over and under the skin. Take the skewers and force one through the thigh perpendicular to bone and just above drumstick, into the breast, and out through the middle joint of the wing. Repeat for the other side of the chicken. Place the skewers on the grill over a medium-hot fire. Grill slowly, turning as needed to brown evenly, for about 30 minutes, or until the internal temperature of the chicken is 160 degrees F. for medium. To prepare the sauce, soak the dried chiles in hot water to soften for about 20 minutes. Remove, drain, and chop. In a blender or food processor place the chiles, ginger, garlic and 3/4 cup water process until almost puree, but still coarse. Place in a saucepan with the vinegar and sugar. Cook until reduced to about half, remove to a bowl, and add basil and salt to taste. Stir it well. This is a much easier version of the famous smoked duck which involves marinating, steaming, drying, and smoking. You can make this in a stove-top smoker. The tea colors the skin an appealing color, and any loose tea will work, even the Orange Pekoe in most tea bags. If using chicken pieces, cut the marinade recipe in half. Serve with fresh spring rolls, pickled radish and carrot relish, and Sichuan noodles with vegetables. Note that this recipe requires advance preparation. If you are using a whole chicken, tie the legs together. Combine all the ingredients for the marinade and place the chicken in a nonreactive pan or large plastic bag and marinate for 24 hours. Combine the smoking ingredients and place in the pan in the stovetop smoker, if you are using legs and thighs. If using a whole chicken and a smoker or grill, wrap the Tea-Smoke mixture with aluminum foil and poke holes in it.. Smoke the chicken in 200 degree F. smoke for 3 to 4 hours or to an internal temperature of 160 degrees F.
Combine the ingredients for the finishing oil and let sit while the chicken is smoking. Preheat the oven to 450 degrees F. Remove the chicken from the smoker, brush with the finishing oil, and place in the oven for 5 to 7 minutes to crisp the skin. Tilapia, a farm-raised fish originally from Asia, is mild and sweet-tasting with a delicate flesh. You can substitute catfish or flounder fillets if you can’t find tilapia. These are the fish fillets most enjoyed by people who don’t like “fishy” fish. They work particularly well for our chile-infused recipes because they are soft and absorb the marinade quickly, Use a fish basket for ease in turning the fillets without destroying them. Sichuan peppercorns and Asian garlic chile paste are available at Asian markets. Serve with a Chinese peanut and noodle salad and garlic broccoli. Minced green onion for garnish. To make the marinade, toast the Sichuan peppercorns on a hot, unoiled frying pan until fragrant. Remove, cool and crush. Combine all the ingredients for the marinade in a bowl and allow to sit for ½ hour to blend the flavors. Place the fish in a non-reactive dish, pour the marinade over the fish and marinate, covered, for an hour at room temperature. To make the sauce, whisk together the broth, vinegar, plum sauce, sugar, cornstarch, and sesame oil in a bowl. Heat a wok until hot and add the vegetable oil. Add the onion, ginger, and santaka chiles and stir fry for a couple of minutes. Add the chile paste and stir-fry for a minute. Add the broth mixture and the red chile powder, and stir well. Increase the heat and bring to a boil, then reduce the heat and simmer the until thickened. Remove the whole chiles. Place the fillets in a grill basket with handles and grill them over a medium fire until they flake with a fork, about 8 to 10 minutes, turning occasionally. Take care that the fillets don’t burn..
To serve, pour a little of the sauce on the plate, place the fish on top, and garnish with the onion.